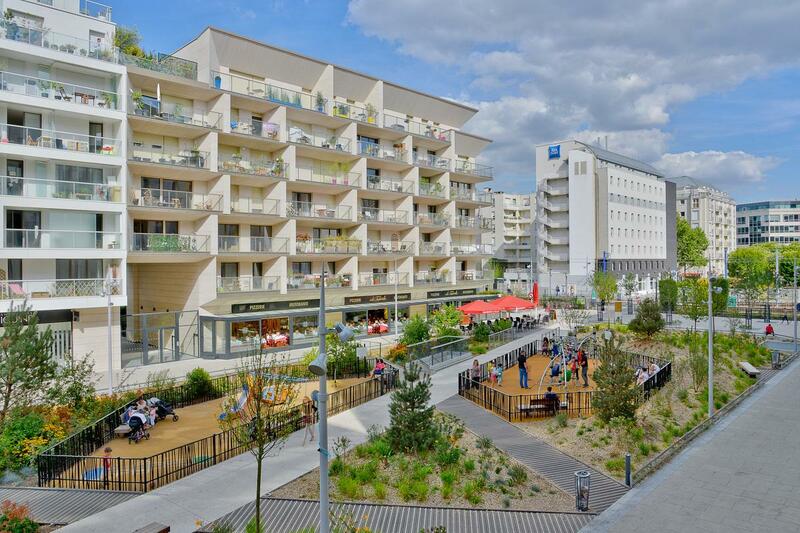 ​The new EcoQuartier reintroduces biodiversity, both in terms of fauna and flora. Green spaces highlight local species and those requiring little watering and maintenance. Soil waterproofing is limited and basins participating in the landscape allow the retention and infiltration of rainwater. The landscaping project compensates for the density of the district, which has enabled the construction of 782 dwellings (including 169 social and 175 hotel residences), 24,000 m² of offices and 2,500 m² of shops. The course of the Old Bakery, which connects the embankments of the tramway to the banks has a wide hold (36 meters wide). It is presented as a central green carpet, hilly contributing to the green mesh of the Banks of the Seine. The result is a neighborhood where life is good and that allowed the Isseans to reconnect with the park of Ile Saint-Germain and the Seine.